Born out of the tragedy of 9/11 and humanity and volunteer spirit that united the world on 9/12 – Stars of HOPE® became a reality in 2007 when the Vincent family of Groesbeck, Texas decided to pay it forward for all the love they received from New York Says Thank You volunteers who helped rebuild their family’s home following a deadly tornado. Their first pay it forward project was simple: empowering 220 children in Greensburg, Kansas to bring hope and color back to their tornado ravaged town by painting inspirational words, messages, and designs on one foot wooden stars. These stars were then planted on every street corner of Greensburg, Kansas a town 95% destroyed by an EF-5 tornado. The Stars of HOPE transformed the physical and emotional landscape of Greensburg overnight. The Stars of HOPE have since lifted the spirits of millions of disaster survivors in 150 communities and 24 countries from Breezy Point, NY to Kathmandu, Nepal and growing. 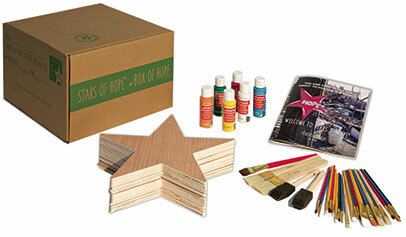 We have launched Stars of HOPE® Box of HOPE! With Stars of HOPE® Box of HOPE your children, friends, family, and colleagues can paint heartfelt messages on Stars of HOPE at your dining room table, backyard party, or workplace gathering. Once dry, you can send your Stars to anyone who needs hope in your community, in the United States, or across the world. Stars of HOPE® Box of HOPE contains everything you need to turn any occasion into a creative and meaningful “pay it forward” service event.